In an effort to confuse everyone, Madden 15 is the 27th game in the Madden football series and the sequel to last year’s Madden 25 – the 25th anniversary edition which was actually the 26th game in the series (or more, if you include Madden Football 64 on the N64 which pretty much screwed up EA’s annual naming scheme). Sure, the 15 just means 2015 – except it’s 2014 and this is the 2014 NFL season. EA, why do you mock us? Assuming you’ve correctly managed to buy the latest version of Madden (we can see 2025 being a particularly tricky year for grandparents of young football fans), you’ll be pleased to know that Madden 15 is actually really good. In a way (if you ignore last year’s slightly lazy effort) this is the first next-gen Madden game, where EA have put some effort in to make things look considerably better than a standard PS3/360 game. They’ve even made some rather innovative improvements to the actual gameplay – you can now properly play as a defensive player. That only took 26 years – well done EA! 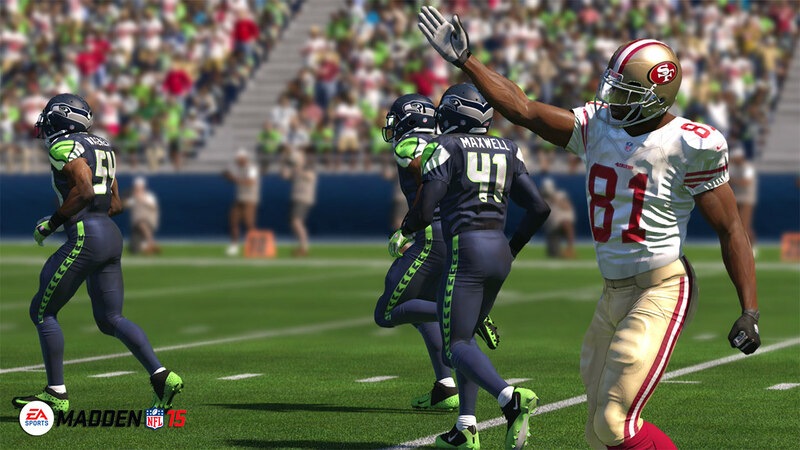 Like most good officially licensed NFL games, Madden 15 features all 32 NFL teams. Some highlights include the Miami Dolphins, who aren’t actually aquatic mammals. They can face off against the likes of the New York Giants (actually quite regular-sized), Seattle Seahawks (fun fact: no such bird exists), or the possibly quite racist Washington Redskins (we won’t comment on the Cleveland Browns). All teams include the real players, accurately stitched uniforms and stadiums in which to play the game. Go football!